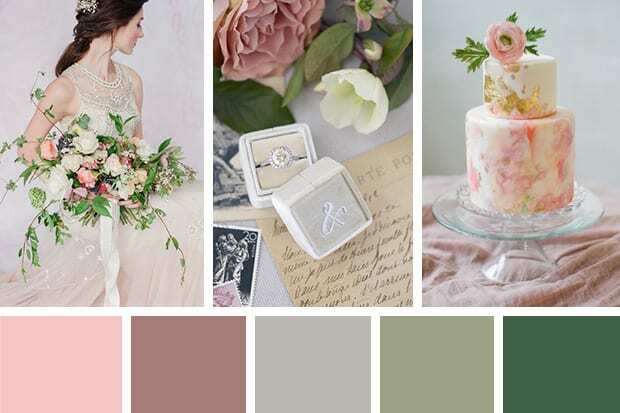 Colour is actually an extension of you, as a bride, and the hues you choose will affect everything — from the ink and paper choices of your invitations to your bridesmaids’ dresses to your bouquets and floral centrepieces to your tablecloths and even your favours. And oh, yes, the cake! OMG! This is a huge decision. So let’s think about colour in everyday life. Colour can create a mood and affect the energy of a space. What do certain colours mean to each of you (The blue of the summer sky at the beach?) Now pick up paint chips at your local hardware store, and play with different combinations. You might be surprised by what you both like. Autumn: taupe or burgundy with copper and a hint of lavender. Spring: Spring colours are usually about pastels, but change it up a bit by adding deep splashes of plum or coral. Summer: Go for bold yellows, purples, reds and blues. Or select different shades of a colour: Coral, salmon and a deep burnt orange would be stunning. Winter: All-white is gorgeous, but add a splash of lavender for warmth. Or go for a metallic, like pewter, silver, copper, bronze or gold, for depth and richness. Your wedding is a blank canvas just waiting for you to paint it in your special colours. Have fun creating a masterpiece!